Save 30% on your lodging when you stay at one of these Fairmont flagship hotels. This pretty much eliminates ALL excuses for not visiting Banff/Lake Louise/Sunshine this coming season! Everyone, and we mean everyone, we send to these fabulous properties comes back raving about their experience. Your savings could range from $200-1,000 depending on the dates and accommodations chosen! Located in the heart of pristine Banff National Park, and within a UNESCO World Heritage Site, The Fairmont Chateau Lake Louise is recognized globally for progressive environmental stewardship and responsible tourism, values at the heart of this historic resort. The journey to this treasured Chateau is a scenic drive featuring unparalleled vistas of soaring mountains, roaring rivers and abundant wildlife - just two hours from Calgary. In 1882 Tom Wilson, the first non-native to view Lake Louise, described the moment he discovered these sights by saying "I never, in all my explorations, saw such a matchless scene". His opinion also happens to echo the sentiments of our guests upon seeing their rooms. 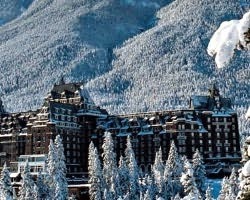 Elegant and polished yet relaxed and inviting, The Fairmont Chateau Lake Louise accommodations strive to live up to the natural wonder with which they share their name. Unwind where the luxury of a bygone era has been perfectly preserved in a guestroom or luxury hotel suite with a heightened level of modern accommodation, heartfelt welcome and genuine service. Great on-site dining, shopping, and recreation options abound, plus enjoy the 10 minute complimentary shuttle to the Lake Louise ski area.